FEMA’s handling of Hurricane Katrina inspired resentment in the affected communities – have changes improved response in recent disasters? Hurricanes, wildfires and earthquakes – is the Federal Emergency Management Agency ready for the new era of disasters? 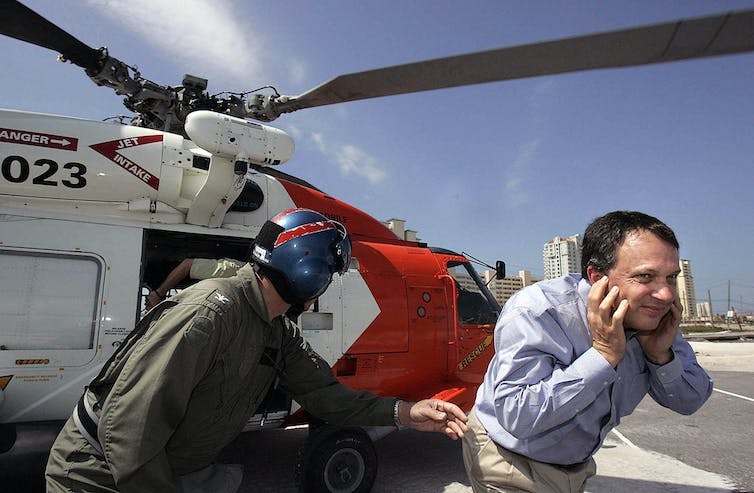 After Hurricane Andrew hit Florida in 1992, the emergency manager of Dade County, Florida famously asked the media, “Where in the hell is the cavalry?” after her requests for aid from FEMA went unanswered. Picking up on the anger, some members of Congress wanted to abolish the agency as punishment for its poor response. FEMA survived, but it came under blistering criticism again after Hurricane Katrina killed 1,833 people and caused more than US$100 million in damage. The response to Hurricanes Harvey and Irma has gone much more smoothly – at least so far. So what has changed with FEMA since Katrina? Presidents learned the importance of placing experienced emergency managers in charge of FEMA. During the Katrina disaster, President George W. Bush told FEMA Director Michael Brown, “you’re doing a heck of a job.” Ten days later, Brown resigned in disgrace. FEMA director Michael Brown was forced to resign over his mishandling of Hurricane Katrina. Brown was only one of the agency’s problems at the time. An academic analysis found that turnover among FEMA leadership and appointees without sufficient qualifications contributed to the agency’s halting response. Before joining FEMA, Brown supervised judges at horse shows. He joined FEMA through a connection with his college roommate, Joe Allbaugh, who was President Bush’s first campaign manager and FEMA director. Since Brown, presidents have appointed FEMA directors with emergency management experience. Current FEMA Director Brock Long was director of the Alabama Emergency Management Agency, and had previously worked at FEMA. One of the signature initiatives of FEMA during the Obama administration was the “whole community” approach, intended to involve the private sector, community groups and individual citizens in disaster preparedness. The whole community approach was intended to harness the assets of civil society, draw attention to disaster resilience and improve coordination. For example, businesses played a key role in the Harvey response. Individual store owners opened as soon as they could to help distribute what people needed. Texas grocer H.E.B. sent convoys to the affected region. The whole community approach is not the only driver of private sector involvement, but it reflects FEMA’s commitment to approaching the private sector and groups of concerned citizens as partners rather than as subordinates in disaster response. Social media inspired collaborative, bottom-up responses that we have only begun to understand. During Katrina, social media was a hobby of techie students. Facebook was not yet available beyond universities. Today, government agencies and rural Texans and Floridians use social media. People found out which shelters were open and who needed help during the storm through texts and tweets. Social media also drives the government’s response because government responds to what’s on CNN. Imagine if pictures of the dangerous conditions at Memorial Hospital, hidden from news cameras during Katrina, had been circulated on the internet and broadcast on television. Lives might have been saved. After Katrina, resilience replaced sustainability as the organizing concept in disaster management. Government agencies and private foundations used the term as a rallying cry to focus efforts on how to prepare for inevitable disasters rather than just avoid them. The Rockefeller Foundation even funded resilience officers in local government beginning in 2013. At its best, resilience refers to the idea that communities can do more than just rebuild. They can invest in levees, canals, wetlands and insurance to adapt to a changing normal. At its worst, resilience is an empty term that gives the impression that cities can bounce back if only they try hard enough. In truth, low-lying regions will have to decide to limit construction and inform people about true risks – both difficult in the face of a worldwide trend toward urbanization and pressures to develop land and make money in the short term. After Katrina, Congress gave FEMA greater authority to move resources to a disaster zone before a storm rather than wait for formal requests from governors after the event. Before Harvey, truckloads of food, water and tents were positioned outside of the flood zone, waiting for rains to subside so they could be sent to the recovery zone. Supplies from FEMA and the Department of Defense arrived within hours, not days, after the rains ended. FEMA’s pop-up hospital drew praise. Despite the lessons learned, some things have not changed. FEMA is still a part of the Department of Homeland Security – an agency that has other priorities. The department was focused on terrorism during Katrina, and now its chief policy priorities are immigration and borders. Neighbors, city and county governments, and then the state are the first responders, not the federal government. Even at the federal level, FEMA primarily coordinates responses led by other agencies like defense, housing and agriculture. Meanwhile, businesses, nonprofits and even individuals with bass boats mounted their own response. Decisions about land use, zoning and development are made at the state and local level, not by FEMA. State and local emergency managers have very little pull over development, and changing the building stock to strengthen 100-year-old homes or make wise investments in new ones requires a larger effort. Socioeconomic status and vulnerability still shape response. People with money are able to evacuate themselves, or return home and rebuild more quickly. People without financial resources, jobs or social connections face greater obstacles to returning to a normal life, and they need help. The best time to prepare for the next disaster is immediately after the current one. Now is the time to communicate true flood risks through flood mapping, strengthen building and zoning guidance, organize community planning efforts to know what to do when the worst happens, and build new infrastructure to send water out of vulnerable areas. FEMA can be a partner in these efforts, but it requires leadership from politicians and bureaucrats at all levels of government. Until then, people will settle in risky places without reducing their vulnerability to storms, making the next disaster even more likely than the last.